Best known for the impressive Ayutthaya Historical Park, a UNESCO World Heritage Site, the city of Ayutthaya has ample to see and do across a couple of days. Within easy reach of Bangkok, a visit to Ayutthaya is highly recommended. And, while you’ve escaped the bustling streets of Bangkok, why not head a little further north to the city of Lopburi? Its ancient beginnings make this one of the oldest cities in Thailand and has both an old and a new town to explore as well as its famous crab-eating macaques who you will see all over the city. But, this isn’t the only reason to visit Lopburi – there are shrines, markets, a palace, and ruined sites to see too. Getting from Ayutthaya to Lopburi is probably one of the easiest trips you will make while visiting Thailand, so why not go for it?! As the crow flies it is only about 50 kilometers (31 miles) between these two cities, but roads and railway lines are confined by rivers and other natural obstacles which means they have to meander somewhat. 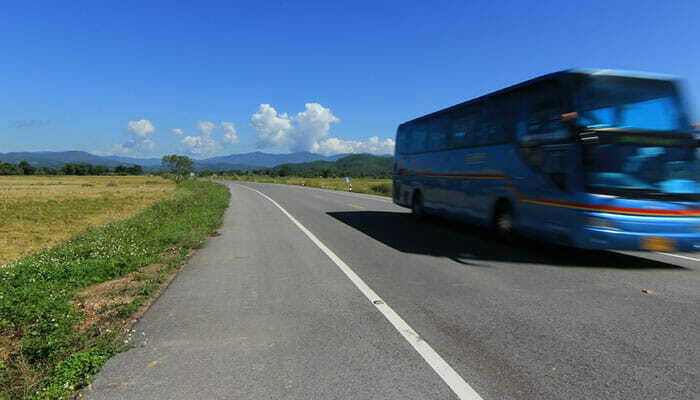 Going by road from Ayutthaya to Lopburi this adds almost 20 kilometers (12.5 miles) to your trip, but even so, it’s still a very short journey compared to many others. Traveling by train is one option that you have, and with direct trains between the cities it’s very convenient. Taxis are another option, and while there are no direct buses, you can easily travel by bus via Ang Thong. Traveling by train in Thailand has many advantages while the major disadvantage is usually the speed, or lack of! Getting from Ayutthaya to Lopburi this isn’t a problem though. 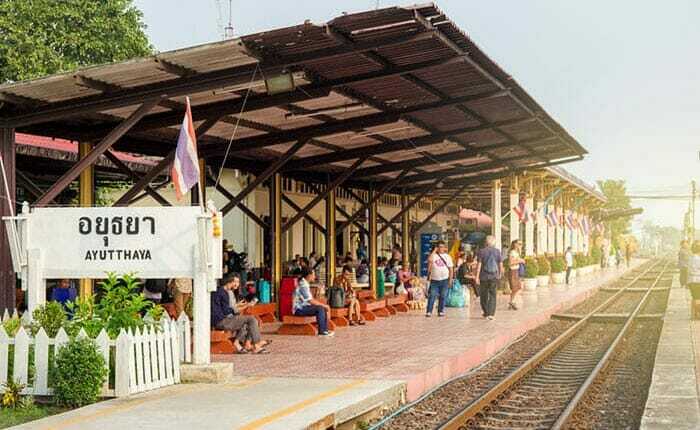 Being such a short journey, the train from Ayutthaya to Lopburi takes only about 50 minutes, giving you almost an hour to relax and enjoy the passing scenery. It’s the perfect way to get a taste for train travel in Thailand and is reasonably priced. There are around nine departures each day from Ayutthaya, traveling on the state-run Thai Railways. You may find a selection of seat types and even sleeper berths available to buy on these trains, but for such a short journey you only really need to buy the most basic 2nd class seats or if you want to travel with even more of the locals, opt for a 3rd class seat. You can find schedules and ticket prices on travel websites like 12Go.asia, where one search provides all of the results available for the date you selected. Trains from Ayutthaya to Lopburi depart throughout the day, starting before 10am, and the last train of the day leaves at 11:35pm, arriving in Lopburi at 12:27am the next day. But with plenty of departure times to choose from, there’s not a lot of point in opting for an evening train unless this is the only one that fits in with your schedule. Many tourists actually choose to visit Lopburi from Ayutthaya in just one day, and with such a short travel time, this is a definite possibility if you leave in the morning. 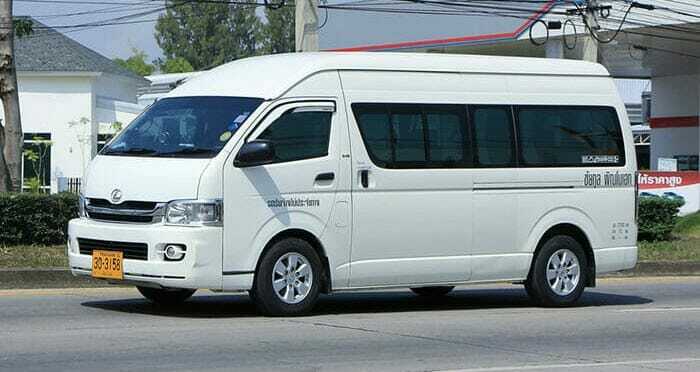 While the trains are reasonably priced, taking a private taxi from Ayutthaya to Lopburi is going to set you back a lot more money, but despite the price there are advantages to traveling by taxi. Book your taxi travel in advance through 12Go for peace of mind because you know it is all set up and paid for. 12Go provides taxi services from Ayutthaya to Lopburi with Thailand Limo by Datum, and when you search you’ll find that there are several different vehicle options. Choose a Premium car if it’s just a couple of people traveling and you want extra comfort, or go for a minivan that holds four passengers if you’re traveling with your family. Bigger groups can even get a 9-passenger van for the trip, and when the cost is divided by 9 people it actually ends up being very affordable. The advantage with private taxis is that you can book them in advance and that they are completely flexible in that you can be picked up from your hotel in Ayutthaya and taken exactly where you want to go in Lopburi, and it’s to your own schedule, so they’re very convenient. With a journey time of just one hour, it’s fast as well. If you’re looking for the cheapest way to travel from Ayutthaya to Lopburi, it’s by bus and minivan. Perfect for those of you who are traveling on a budget, the bus will cost around $5, but it is the slowest way to travel between these cities. Even so, a journey time of around 1 hour 45 minutes is not exactly long, and while the buses will not be particularly comfortable, it’s easy to put up with it for a short journey such as this. The bus takes longer than traveling by train or taxi because it’s not direct. Buses depart from Ayutthaya and travel north west to Ang Thong. Once there you will transfer to another bus and head north east to Lopburi. The transfer time is around 15 minutes, giving you enough time to stretch your legs, use the facilities, and figure out where your next bus is! From Ayutthaya to Ang Thong the buses depart hourly, and from Ang Thong to Lopburi they depart half hourly, so if you happen to miss this bus you won’t have to wait long for the next one. With all modes of transport taking less than 2 hours to get you from Ayutthaya to Lopburi, it’s a quick trip however you choose to travel. 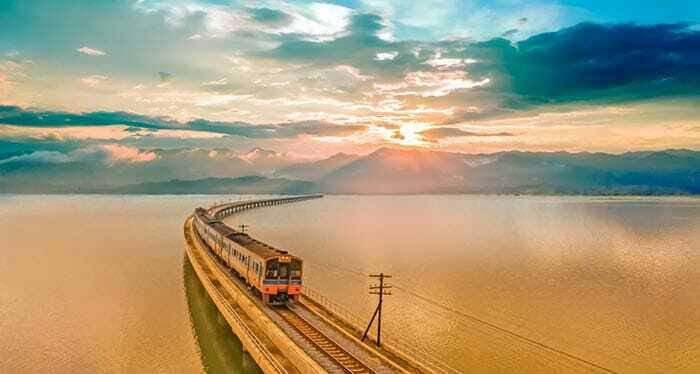 If you’ve not traveled by train in Thailand before, then we’d recommend taking the train, but if you’re keeping to a tight budget, the bus is also a good option.